Here’s a Halloween animated greeting card for y’all that I knocked up! For some real advice on HOW to be Halloween Fabulous read Ian’s sage words of advice. Dr. Nick Deadly gets bored and takes time out to work on an extra-curricula project. Plus, there was queue for the toilet. They said, ‘It couldn’t be done!’… well more, ‘I don’t want to do it!’. But one digital pen, 3 dogs lives and lawsuit later I had proved them wrong. If you’re interested… Excuse me. Yep. 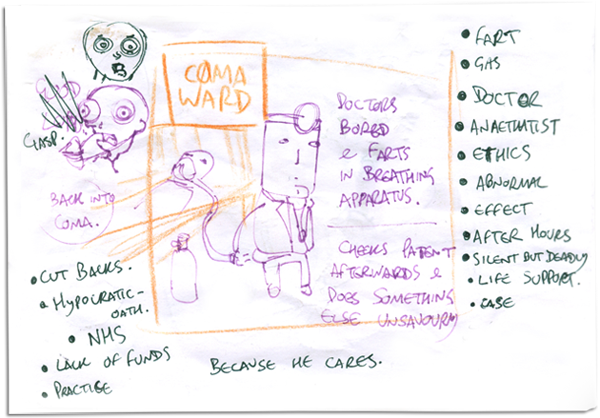 Hi… here’s the original scribbles I did on a tiny scrap of paper a few years ago. The words are me trying to give it a title.